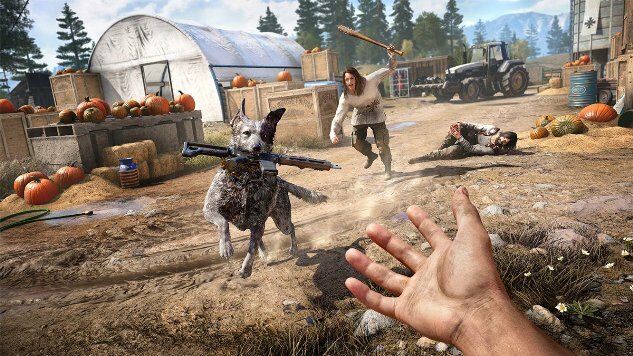 If you need some extra money or just some extra bragging rights out of your Far Cry 5 game, a good way to get it is by conquering an outpost completely undetected. Killing every last guard in an encampment without being spotted can be tricky, but it nets you a bonus $1000 in cash and a priceless amount of personal satisfaction. If you prepare yourself before heading in with these handy tips, you’ll come out richer and in one solid piece. One of the better ways to go fully undetected is to snipe outpost guards from a distance before getting up close and personal—if you get in close at all. Most guards are visible enough to be picked off several dozen feet from the perimeter. Those that aren’t can, of course, be taken down from behind. As a general rule you should try to keep a guard or enemy’s back towards you. When choosing a stealth weapon, I suggest going with a bow. What it lacks in range, it makes up for in stealth. Be sure to fully upgrade before heading out (plus stock all your arrows, and upgrade your quiver in the Perks menu, if you can). One immensely helpful booster is Ultimate Hunter, a crafted substance made in the weapons menu that will “automatically tag all the animals and enemies in your sight and make predators flee.” It’s temporary, and you can only hold three at a time, but that should be enough to get a good head start on any outpost, and it will help you hold your concentration and hide your position by ensuring hostile animals will keep their distance. Put it together with two Prairie Fire, two Mustard, and two Jimson Weed. Pro tip: when it tags the guards in an outpost, point your long range weapon at each of them so they’ll still be tagged once Ultimate Hunter wears off. There’s no shame in sitting back and letting a bear or cougar pick off some of your enemies for you. It’s a great way to reduce their numbers without drawing attention to your position (though beware, guards can detect sometimes where an item was thrown from). It will also distract the guards enough that you can kill a few more in the chaos before they catch on. Just be sure to stock up on bait before you head out—only passive animals like Pronghorn will provide bait meat. Always know your outs. Inevitably there are going to be environmental obstacles that you’ll need to navigate around in a moment of panic. Familiarize yourself with the surrounding area: where are the cliffs? Are there pools of water or hot springs nearby? Where are the thickest trees to hide behind? Scout the place beforehand and do a few circles around the camp to make sure you know where you’re going. You should station yourself reasonably far outside the outpost so as not to be seen, but not so far that you’re out of range with your bow or sniper rifle (the bow will draw much less attention). When you make a kill from a distance, start moving in the opposite direction of any enemies who rush over to the body; if they go left, make your way right, passing through cover spots. Do not play with the enemy’s detection system; if the heat starts to rise, start moving immediately, establish distance, and find cover. For the heavier guards with superior armor or weapons, a single shot to the head isn’t going to cut it—and the more shots or arrows you have to fire, the more attention you’ll draw to your position. First eliminate all the single-shot guards, so they’re all out of the way. Then use Takedown on the harder ones from behind. Also, remember to upgrade your Takedown skill to Takedown Mastery so you can perform chain Takedowns (Death From Above, Ledge and Cover Takedowns are all unlocked by default in Far Cry 5). Another easy way to ruin a perfectly good undetected outpost run is to not pay attention to what’s happening up on the main drag. There’s almost always a road nearby, or a body of water, which means you’re vulnerable. If a patrolling group of guards wanders nearby and spots you, the guards from the outpost can and will join in, which will totally blow your cover. The same goes for airplanes, so stay under the cover of trees and bushes as often as you can. Once you’ve gotten in close to an outpost and scouted it for a good sniping spot, find their sniper. There’s always at least one, and usually they’re at the highest point. Always kill the sniper at the highest point first. They can see almost everything in the outpost, and will alert the other guards the minute you kill one of their own. Take him out first and you’re way less likely to get caught.